My first camping experience was only about a year ago with few friends at Mount Papandayan. It is about 3 hours drive by car from Bandung city then continue with 2 hours hiking up to the campground. Spending night in the nature, gathering around the campfire set not far from our tents, eating simple fried rice under such cold weather on the mountain plus not forgetting the hot milk with ginger, to me, those were fun experiences. But, unfortunately not all people feel comfortable staying in such tent with limited facilities – Don’t talk about sleeping for a night yet. Especially if we plan to camp with children, it can be a horror for some families. But how if we do really want to experience camping with our friends or family? Is that really impossible? Last month, June, was a slow month for me. I had pretty much ‘stay-at-home’ times, not travelling, not leading any groups and such. Meanwhile, most of my close friends are teachers, so their liberty to go for vacation is really depending on the school holiday which also starts in June. So, AHA! Then I thought, why not we plan a short getaway out from Jakarta for fresh air and Bandung just sounds good to me when my friend suggested it. Orh, not forgetting the pleasant weather in Bandung! Then I browsed around on the internet looking for accommodation in Bandung – an interesting and unique one, since we seldom to have gathering time like this. Found no clues on the internet then I asked my friend instead who eventually introduced me to Trizara Resorts, accommodation with camping concept. Without hesitate, I immediately said yes to it. As we took the last turn from the main road heading to Trizara Resorts, we held our breath looking at the road in front of us. Not because we were too excited but we were thinking if the road ahead would be too steep for our gentle car, Daihatsu Ayla, that we went with that day. We stopped talking and laughing for that ‘defining’ minutes as the car moving uphill so did we somehow move our body forward as well following the car movement. I believe we actually know it didn’t do much help but we still did it hoping we didn’t weight down our car and move backward instead. Once we reached flat ground, phew, we laughed out loud. We were almost there! We were only few metres away from our destination. 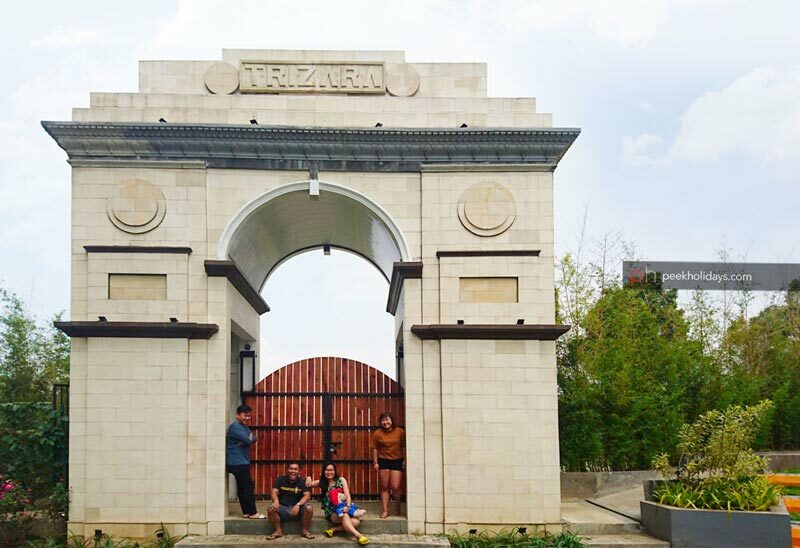 Trizara Resorts is located at the peak of Lembang, West Bandung, about 45 minutes drive from the city. The direction signboard of Trizara Resort is clear so we don’t have difficulty at all to find the place although it is not by the main road. The gate entrance of Trizara Resorts is magnificent, it doesn’t look like the usual gate that we often to see elsewhere. When I looked at the gate from the outside, I felt that there’s something precious hidden behind the wall. Probably there is a treasure box buried somewhere. Ah..just my imagination. Glamping is like an answer from the heaven to my questions earlier. How if we go with children? What will we eat there? And many other questions that might come up in your mind when someone ask you to go camping. Glamping or glamorous camping is another way of camping – staying in a tent – but with facilities. Instead of sleeping in a sleeping bag on a sleeping mat, we get to sleep on a comfy bed. Instead of cooking in the wild with wood fires or portable stove, we get to have our meal served right on the table in the dining area. We don’t have to worry about the toilet or shower issues as we have en suite full bathroom in our tent. Doesn’t it sound good to be true? Luxury camping, that’s right. That’s what I am talking about here. Not the style of camping that I showed you earlier. There are total of 47 tents in this 3 ha area of Trizara Resorts with four type of tents that can sleep for two, Netra and Zana, and for four people, Nasika and Svada. When I say tent, it is really a tent. A big size tent. So, we won’t be surrounded by four brick walls except in the bathroom that has minimalist design with full bathroom amenities. While the bathroom is using a wooden door, the front door is using zipper like what we can find in usual camping tent. That adjustable safari chairs in the terrace is just a perfect combination with the tent. Me and my other three friends stayed in Svada tent with one queen bed and one single bed with a pull-out bed on below. I remember the pull-out bed was big enough for me and my two other friend to sat on when we played UNO card game that we borrowed from the front office. It is probably a super single size bed or even bigger? I should have measured it that day. The room is warm and cozy with natural lights from the windows on both sides of the tent. There is no air-conditioning system but who needs one under such nice weather. It can be pretty cold at night but fret not, the tent is good to keep us warm at night. While during daytime, if we feel warm, there is a ceiling fan installed in every tent. With the wind blowing in gently, who can say “No” for taking nap a little bit longer? The misty morning with the sun playing hide and seek behind the clouds, it was a beautiful one. It was 5.20 in the morning, I walked towards front door of our tent and unzipped it slowly, afraid of waking up my friends who were still sleeping. The sky was not clear and I couldn’t really see the sunrise. But I was offered another view that morning as I was standing at the terrace. I saw a breathtaking view that made me think of nothing but just feeling grateful. I was almost lost once on the mountain but it didn’t stop me from coming back again for another night hiking or trekking trip. It is that serene and peaceful feeling during the journey that gets me want to come back for more. When I was sitting on the seating area near the bonfire place enjoying the view, it gave me almost the same feeling. Calm, peace and beautiful. The only difference is, in here we don’t need to trek uphill for hours just for a view like this. The misty morning with the sun playing hide and seek behind the clouds, it was a beautiful one. How can I not be grateful for still being able to see this nature beauty? The main concept of Trizara Resort is to let guests enjoy the nature without any distractions. While it is called as a luxury camping, but it doesn’t mean that we are expected to stay indoor all the times. That’s why we won’t see any phone or television in our tent. However, there are optional outdoor activities that we can sign up for, such as morning Yoga, Outdoor Zumba, and Boxing. If you love to run or jog, there are paved pathway and inclined slopes within the resort that support our training. Else, have a picnic in the park sounds good, too! One of the interesting facts about Trizara Resorts is they also provide meeting rooms for guests who want to conduct a family gathering, corporate meeting or any other special events. With still holding the glamping concept, the meeting room will also be in an unconventional room – a tent. There are three meeting tents available for use with booking in advance. How about biking around the resort area? I remember Mr. Kunal, the owner of Trizara Resorts, told me that the building process of this resort was based on the ideas from the local residents around. So, in other words, the locals were heavily involved in making this resorts to be what it has become today. Not only that, the staffs that are working in the resort were recruited from the local residents that also have been trained by the management team before they start to work at Trizara Resorts. That could be why we can feel so much love in this resort. This is their ‘baby’, too! It may only a short 3D2N escape from Jakarta trip but definitely one of the memorable trips that I have ever had. Great place with great friends, what else could I ask for more? I believe the outcome will be different if we chose to stay in other places. The background story of the resort, the beautiful view, the unusual concept, all play well together to make this a great place for anyone to stay. Next articleIlugaimo and Yakop, Thank You.